Yes! We offer free shipping and handling on orders over $100.00 with a valid coupon code (that we give you inside the cart!). Your free shipping includes economy shipping and must be within the 48 contiguous United States. Certain rods, gaffs, antennas, coolers, and other oversized, bulky, or multiple package shipments may require additional charges. If you qualify for free shipping, and don�t see a coupon code in your cart, contact us by email (sales@tackledirect.com) or by phone (toll-free 1-888-354-7335). Yes, we do! We're really proud to be a family-run business in the United States of America and recognize that our very existence wouldn�t be possible without the daily sacrifices of our men and women in uniform. If you�re a military veteran, please contact us by email (sales@tackledirect.com) or by phone (toll-free 1-888-354-7335) to secure your discount. How do I use a promotion / coupon code? Promo code � lucky you! There are two opportunities to enter your promotional code. CART: If you are on the cart page, click on �Enter Promotional Code� inside the right-hand �Order Summary� box. Enter your code, and hit �Apply�. CHECKOUT: If you�re already in checkout, no problem. Scroll to the bottom of the page and look for a blue heading titled �Other Information.� Enter your promotional code in the first field and select apply. At TackleDirect, we make every effort to provide you with the lowest prices, while adhering to the manufacturers' minimum retail pricing. We will match any price offered by any retailer with a brick and mortar physical address. We do not match eBay or eCommerce stores who do not maintain a physical address. If you find an identical product at a lower advertised price and in stock on another site that matches the criteria above, we'll match the price, as long as the item does not have a set minimum retail price by the manufacturer. Simply contact us via telephone 888.354.7335, or email: (sales@tackledirect.com) for pre-authorization. How will you ship my fishing rods and poles? At TackleDirect, we're anglers just like you. That's why we treat your rod like we treat ours -- with the utmost attention to package strength and security when shipping it. We specifically pack the tip of the rod in multiple layers of bubblewrap so that it doesn't roll inside the rod tube. We also wrap the base of the rod to further limit movement in transit. Then, we load the rod into a custom-designed, sturdy, paperboard tube. Watch to see exactly what we mean. Fishing is hard enough; buying fishing tackle shouldn�t be. That�s why we offer three easy ways to order from TackleDirect. Now that you�re in Checkout, enter your Shipping, Billing, and Payment information when prompted. We accept payment via credit card (Visa, MasterCard, American Express, Discover, JCB, Diner�s Club) as well as Amazon Pay and Paypal. If you�d like to pay with a check, money order, or wire transfer, please contact customer service at sales@tackledirect.com. When your information is entered, please select �Send Order.� Your order will then be processed through our secure service. Did you get an error message? Check here for common errors and how to fix them. PHONE: Call us Monday � Friday from 8:00 AM � 6:00 PM Eastern Time and Saturday 9:00 AM - 6:00 PM Eastern Time and a product specialist with process your order over the phone. We can be reached directly at 1-609-788-3819 or toll-free at 1-888-354-7335. You may call outside of our normal operating hours and leave a message. Our team will call you back within 24 hours. IN-STORE: If you�re in the southern New Jersey area, the best way to shop with us is inside our massive 24,000 square foot retail store in Egg Harbor Township, New Jersey. Come visit us Monday � Saturday from 9:00 AM � 6:00 PM ET at 6825 Tilton Road, Bldg C, Egg Harbor Township, NJ 08234. Need directions? Click here. Is there anything harder than waiting for new tackle to come in the mail? We know the struggle! That�s why we provide 24/7 tracking and transit information. Just click here and enter your order number and billing zip code. It may take us 1-business day to update our systems with your recent order. Please be patient. If you still can�t check on your order status, contact us via email (sales@tackledirect.com) or phone (1-888-354-7335). Why does my order have sales tax? TackleDirect is located in Egg Harbor Township, New Jersey USA. We are required by law to collect a 6.625% New Jersey State sales tax on taxable items and shipping fees for orders delivered within the State of New Jersey. Clothing is non-taxable, but technical apparel, such as waders, and related footwear are taxable items. We are also required by law to collect a 6.35% Connecticut Sales Tax on taxable items and shipping fees for orders delivered within the State of Connecticut. On International orders, duty, customs, and any other taxes are the customer's responsibility. At TackleDirect, we make every effort to provide you with the lowest prices, while adhering to our manufacturers� minimum retail pricing. If you find a price cheaper anywhere, please give us the chance to match it! If you have any questions or concerns about our pricing, we encourage you to reach out to our Customer Service specialists by email (sales@tackledirect.com) or by phone (1-888-354-7335). Help! I need my item right away. There is nothing worse than needing an item by a certain date and not getting it. That�s why we strongly encourage you to contact us first (by email at sales@tackledirect.com or by phone at 1-888-354-7335) if delivery time is critical. Inventory status indicators are available for all items and determined in real-time. However, discrepancies can occur. If you need your item by a certain date, please contact us first to confirm its availability and your shipping options. Backordered items will be marked by a red �BACKORDER� inventory status on the website. Occasionally, discrepancies occur. If the item you ordered is backordered, we will notify you via e-mail or phone right away. We do not have backordered items in stock. Backordered items must be ordered by a vendor or supplier and then shipped to TackleDirect for processing. The item may be backordered for a number of reasons, including high product demand, seasonality, or general lack of stock. While we will provide you with an estimated ship date via email, these estimates are subject to change. We promise to process and ship your order the same day it is delivered to TackleDirect. For most backordered items, you will not be charged in the original purchase for any additional shipping charges that may result. TackleDirect reserves the right to cancel any order for a backordered item under $25.00. If your purchase is being shipped domestically, we will ship your in-stock items first and your backordered items when they come in. You will be charged for shipping only once. If your purchase is being shipped internationally, we will wait until all your items are in stock to ship them. We will not make multiple shipments internationally. Any backordered item that we cannot fulfill within 30 days will be cancelled, and you will be refunded using your original payment method. We apologize for the inconvenience. Most backordered items will be shipped USPS or Economy unless otherwise specified by the customer. Yes! We ship worldwide to over 60 countries every day. International orders must be paid in United States dollars, drawn on a United States bank by MasterCard, Visa, American Express, Discover, Amazon Pay, JCB, Diner�s Club, Paypal, Cashier�s Check, International Money Order, or Wire Transfer. Non-insurable orders are the customer�s responsibility. All credit card payments require the cardholder�s billing address (where the credit card statement is mailed), shipping address, phone number, card number, expiration date, credit card issuing bank name, and bank phone number for authorization purposes. Complete address verification is necessary before order shipment. Yes. On international orders, duty, customs, and any other taxes are the customer's responsibility. Please contact your local customs agency for information on rates. By law, we must declare all items at their fill price and cannot amend your order transcript to lower your customs or taxes. What happens if I refuse an international shipment? If you refuse an international shipment from TackleDirect, you are responsible for the original shipping fees, customs/duties/taxes, and return shipping fees. This amount will be deducted from your original purchase refund. Yes, we do! We�re really proud to be a family-run business in the United States of America and recognize that our very existence wouldn�t be possible without the daily sacrifices of our men and women in uniform. If you�re a military veteran, please contact us by email (sales@tackledirect.com) or by phone (toll-free 1-888-354-7335) to secure your discount. Why does my order say �Pending Shipment�? You order status says �Pending Shipment� because an item you ordered is out-of-stock. We�ve already contacted the manufacturer to receive your item. It may be out-of-stock for a number of reasons, including high product demand, seasonality, or general lack of stock. While we provide you with an estimated ship date via email, these estimates are subject to change. However, we promise to do all on our end to get you your item as fast as possible. We will process and ship your order the same day it is delivered to TackleDirect. If you have any questions or concerns, please reach out by email (sales@tackledirect.com) or by phone (toll-free 1-888-354-7335). For out-of-stock items, you will not be charged in the original purchase for any additional shipping charges that may result. We do reserve the right to cancel any order for an out-of-stock item under $25.00. We will contact you if this step is required. If your purchase is being shipped domestically, we ship your in-stock items first and your backordered items when they arrive. You will be charged for shipping only one. If your purchase is being shipped internationally, we will wait until all your items are in stock to ship them. We will not make multiple shipments internationally. We accept payment via credit card (Visa, MasterCard, American Express, Discover, JCB, Diner�s Club) as well as Amazon Pay and Paypal. If you�d like to pay with a check, money order, or wire transfer, please contact customer service by email (sales@tackledirect.com) or by phone (toll-free 1-888-354-7335). Your credit card will only be charged after your order ships. If you placed an order and it has not shipped yet, you will see an authorization on your account. This authorization will clear within 48-72 hours of your card being charged. If you are in the United States and place a single order that includes items in-stock and backordered, your card will be charged twice. First, for the cost of the in-stock items (when the in-stock items ship), and second, for the cost of the backordered items (when the backordered items ship). What is PayPal Credit (Bill Me Later)? PayPal Credit is a service that allows you to buy now and pay later. (Think of it like a virtual credit card.) You can apply for PayPal Credit or simply add it to your existing PayPal account. Please see PayPal�s website for more detailed information: https://www.billmelater.com/about/index.xhtml. Help! Why won�t my order won�t go through? We got you! Check below for some common cart errors. But as always, we�re happy to troubleshoot for you, so please give contact us by email (sales@tackledirect.com, response within 24 hrs) or by phone (toll-free 1-888-354 7335, Monday � Friday 8:00 AM - 6:00 PM ET and Saturday from 9:00 AM � 6:00 PM ET). Based on items in your shopping cart, there was no match to any of the defined shipping rates. Whoops! Sometimes this happens when you choose a shipping method and then later add an item to your cart. Please clear the shipping method chosen. The list of available options should refresh. Please then select a shipping method from the list and continue to checkout. You don�t seem to have supplied the recipient�s shipping phone number. We require you enter the recipient�s phone number so that we can contact you about your order if a problem arises. Per our privacy policies, we promise to never sell or disperse your phone number (or other information entered). We�ll also never call to ask you for your tilefish numbers. The promotion / coupon code you have entered has expired. Don�t panic, first, double check to make sure you entered your coupon code correctly and in the correct space. If you still see the error message and think it�s a mistake, please contact us by email (sales@tackledirect.com) or by phone (toll-free 1-888-354-7335) and we�ll double check the coupon. If the coupon has expired, please leave the coupon code field blank and continue to checkout. TackleDirect reserves the right to refuse fulfillment of a product transaction in respect to any product or quantity of products, based solely on its own discretion and in accordance with any and all US and international laws. This right shall exist at all times, even after an order confirmation has been placed. This restriction is subject to change without prior notice under the sole discretion of TackleDirect. If you think there has been a mistake with your order cancellation, please contact us by email (sales@tackledirect.com) or by phone (toll-free 1-888-354-7335). When you press send, so do we! Your order confirmation is sent to the email address you listed in the Billing section as soon as you place your order. If you don�t receive a confirmation, check your spam folder. Still nothing? Give us a shout by email (sales@tackledirect.com) or by phone (toll-free 1-888-354-7335). Why was the number of items I ordered changed? We reserve the right to limit quantities on orders placed by the same account, on orders placed by the same credit card, and on orders that use the same billing or shipping address. We will notify you if such limits are applied. If you see this error on your order, and are not a reseller, please contact us by email (sales@tackledirect.com) or by phone (toll-free 1-888-354-7335). Help! The information I looked at yesterday was different. We�re always updating the site according to stock, accuracy, and vendor pricing. As a result, all prices and descriptions listed are subject to change without notice (though they rarely do!). Any product may be removed from a current sale at any time. We strive to provide the most accurate information to our customers. Typographic or photographic errors are subject to correction. If you see an error, let us know by email (sales@tackledirect.com) or by phone (toll-free 1-888-354-7335). If all the items of your order are listed as in-stock, and you place your order by 2:00 PM ET Monday � Friday, your order will ship same day. If your in-stock order is placed after 2:00 PM ET, it will ship the next business day, except for orders shipping via our Economy method. Click here for information on how your order will ship if it includes items that are available from supplier or backordered. Please note: Since USPS is a domestic postal service in the United States, international shipments sent via USPS are handed off to your local domestic postal service at the border. International customers are responsible for all duties, customs, and taxes imposed by local custom agencies. My order status says shipped, but I�ve only received part of my order. Don�t worry, we didn�t forget the rest of your order. If you�ve received a partial order, it�s because the other item(s) on your order are out-of-stock. We�ve already contacted the manufacturer to receive your item. It may be out-of-stock for a number of reasons, including high product demand, seasonality, or general lack of stock. While we provide you with an estimated ship date via email, these estimates are subject to change. However, we promise to do all we can on our end to get you your outstanding item(s) as soon as possible. We will process and ship your order the same day it is delivered to TackleDirect. You will not be charged for out-of-stock items until they ship. You will not be charged for any additional shipping that may result. Any backordered item that we cannot fulfill within 30 days will be cancelled, and you will be refunded on your original payment method. Most backordered items are shipped via USPS or Economy unless otherwise specified by the customer. If you�d like to change your order as a result of its status, please reach out to us immediately by email (sales@tackledirect.com) or by phone (toll-free 1-888-354-7335). Nothing is harder than waiting for a tackle delivery. We understand! That�s why we have an easy, online tracking tool to follow your order from our warehouse to your door. Just click here and enter your order number and billing zip code. If you order was delivered, but not received by you, please contact us as soon as possible by email (sales@tackledirect.com) or by phone (toll-free 1-888-354-7335). I need my order fast. Can I pay for expedited shipping? Yes, of course! We offer 1-Day Service (click here to see all our shipping options). However, if you need an item by a certain date, we strongly encourage you to contact us first (by email at sales@tackledirect.com or by phone at 1-888-354-7335). If you live outside the 48 contiguous states, please use the �Estimate Shipping Cost� link located on each product page for real-time, live-inventory estimates on your shipping cost and speed. If you live within the 48 contiguous United States, your order will take no more than 7 days to arrive, depending on the shipping method you chose in checkout. To see our available shipping methods, and their rates and speeds, click here. If you live within the 48 contiguous United States, we offer eight shipping methods. It�s just part of our Customer Service to provide you with as many different options, prices, and delivery dates as possible. In-Transit days are business days from the ship date. Only USPS First-Class Mail considers Saturday a business day. Additional charges may apply for fishing rods, oversized, bulky, or multiple package express shipments. Click here to learn more. If your order includes in-stock and backordered items, the in-stock items will ship immediately via the shipping method chosen in checkout. The backordered items will ship as soon as possible via Economy, unless otherwise specified by the customer. You will not be charged for the Economy shipping. Shipping cost for Standard Oversize is calculated in your shopping cart based on the weight, dimensions and destination of your order. Shipping cost for 3 Day Service is calculated in your shopping cart based on the weight, dimensions and destination of your order. Shipping cost for 2 Day Service is calculated in your shopping cart based on the weight, dimensions and destination of your order. Shipping cost for 1 Day Service is calculated in your shopping cart based on the weight, dimensions and destination of your order. On select small, lightweight items, we offer a USPS First-Class Mail shipping method at favorable rates. This shipping method will only be available for a select number of items or order configurations that meet the minimum weight and dimensional requirements. Most in-stock items that meet the criteria will arrive in 1-4 days. Saturdays are included as shipping days. Sundays and holidays are excluded. This is often your lowest cost shipping option for larger shipments, when available. Your order will be sent the most economic method based on the weight, dimensions, and delivery location of the items in your order. Most in-stock items will arrive in 2-7 business days, weekends and holidays are not included. Orders shipping via our Economy method our not guaranteed to ship same day if ordered by 2:00 PM ET. This is the only option that will allow for shipping to post office boxes (P.O. Boxes) and APO/FPO/MPO military locations. If a shipping promotion is being offered for free or reduced shipping costs it will typically only apply to this Economy shipping method. This is the lowest cost shipping method for select oversized or heavy items that do not qualify for our normal Economy rates and must be determined in real-time based on the weight, dimensions, and delivery location of the items in your order. Most in-stock items will arrive in 2-7 business days, weekends and holidays are not included. Your order will be sent via a ground shipping method from either USPS, UPS or FedEx based on the weight, dimensions, and delivery location of the items in your order. Most in-stock items will arrive in 1-5 business days. Choose this option if you want to make sure your shipment arrives 1-2 days faster than the Economy method. This shipping method applies when select oversized or heavy items are in your order and our normal Standard Ground rates do not apply. Your order will be sent via a ground shipping method from either USPS, UPS or FedEx based on the weight, dimensions, and delivery location of the items in your order. Most in-stock items will arrive in 1-5 business days. Choose this option if you want to make sure your shipment arrives 1-2 days faster than the Economy Oversize method. Your order will be sent via a shipping method that estimates the 3 business days in-transit or less, weekends and holidays are excluded. Based on the weight, dimensions, and delivery location of the items in your order, your items will ship from either USPS, UPS or FedEx services. Most in-stock items will arrive in 3 business days or less. Any back-ordered items will be sent via the Economy method unless otherwise specified by the customer. Your order will be sent via a shipping method that estimates 2 business days in-transit, weekends and holidays are excluded. Based on the weight, dimensions, and delivery location of the items in your order, your items could ship via USPS, UPS or FedEx services. Based on the delivery destination, not all orders will ship via air and may be sent via ground services that have a time in-transit commitment of 2 business days or less. Most in-stock items will arrive in 2 days or less. Any back-ordered items will be sent via the Economy method unless otherwise specified by the customer. Your shipment will be sent via a shipping method that estimates 1 business day in transit, weekends and holidays are excluded. Based on the weight, dimensions, and delivery location of the items in your order, your items could ship via USPS, UPS or FedEx services. Based on the delivery destination, not all orders will ship via air and may be sent via ground services that have a time in-transit commitment of 1 business day. Most in-stock items will arrive in 1 business day. Any back-ordered items will be sent via the Economy method unless otherwise specified by the customer. PRODUCT PAGE: Click �Estimate shipping costs� under the �Add to Cart� button on the product page. Enter your postal code and select your country. Below, you�ll see a list of available shipping methods, estimated costs, and delivery times. CART: In the cart, click �Estimate your shipping and tax� in the right-hand Order Summary. Then, enter your postal code, state or territory, and select your country. Hit �Apply,� and you�ll see a list of Shipping Methods, complete with costs and delivery dates. Please see above to view the general costs associated with each shipping method. There are two ways to accurately estimate your shipping cost based on your location, billable weight, and package dimensions before checking out. If you live within the United States, we ship to P.O. boxes. Please note, that 1 Day Service and 2 Day Service is not available to P.O. Boxes due to carrier restrictions. To utilize these shipping options, you must provide a valid street address. We do not ship to P.O. boxes internationally, unless it is an APO/FPO/MPO. Those orders are sent via USPS. Please allow 4-6 weeks for delivery. Yes, with some restrictions. Hazardous merchandise cannot be expedited or shipped internationally. A hazardous charge may by applied for ground shipping. And all orders containing hazardous items totaling at least $1000 will require a signature upon delivery. What is the Tube Fee? A $7.00 tube fee is added to certain rods, antennas, or other oversized items over 6� in length. Only one tube fee will be levied, regardless of how many oversized items are shipped in one order. Orders made from November 21st, 2016 to December 24th, 2016 will have an extended return period up to January 31st, 2017. If, for any reason, you are not satisfied with your purchase, you may return it within 30 calendar days of receipt for an exchange or a refund. Your item must be new and unused. It must include the original manufacturer tags and identification stickers. Your item must be in the original box and include all accessories. Special orders, pre-spooled line, and sale items are not returnable. However, if your item is defective, please contact us right away email (at sales@tackledirect.com) or by phone (toll-free, 1-888-354-7335). Egg Harbor Twp, NJ 08234-4426 USA. Please clearly print your name and address on the outside of the package and include a copy of your TackleDirect invoice or packing slip inside the package. When your shipment has been received, we will issue an exchange or refund on the credit card account charged, less any shipping fees incurred. If your item is defective, it must be returned directly to the manufacturer. Please contact us by email (at sales@tackledirect.com) or by phone (toll-free, 1-888-354-7335) so that we can help. Tackle Direct reserves the sole right to refuse the return of any item in which the purchaser has made previous multiple returns or if the product has been used. In addition, we will not accept orders from customers that have demonstrated a high incidence of returns after purchase. STEP 1: Check above to ensure your purchase qualifies for a refund. STEP 2: Contact us by email (sales@tackledirect.com) or by phone (toll-free 1-888-354-7335) to receive a Return Merchandise Authorization number. Make sure to include original manufacturer tags and identification stickers, original box and all accessories, and your TackleDirect invoice or packing slip. Please also print your name and address on the outside of the package. That�s it! We�ll then email you a status of your return or exchange. Please note that shipping is non-refundable. If you�d like to return or exchange an item in-store, please make sure to bring your original receipt and method of payment. Your item should be new and unused and have all original manufacturer tags, identification stickers, box, and accessories. Not long at all! If we receive your return before 2:00 PM ET Monday - Friday, it will be processed same day. If it is delivered after 2:00 PM ET, we will process it the next business day. Can an order from the Clearance Canyon be returned? All sale items are final sale, including items listed in Clearance Canyon. If you think your item is defective, please contact us right away by email (at sales@tackledirect.com) or by phone (toll-free, 1-888-354-7335). How do I use an e-gift card? STEP 2: Browse or search for what you want to buy and proceed to checkout. STEP 3: On the checkout page, scroll to the bottom �Other Information� section and enter your e-gift certificate number in the �Coupon Code / Promotional Code� area. That�s it! If you have enough money on your e-gift certificate to cover the cost of your order, you will not be required to enter any credit card information. If you don�t have enough money on your e-gift certificate, you�ll be prompted to enter payment information to cover the outstanding amount. How do I give an e-gift certificate? If you�re asking this question, we can already tell you�re one savvy gift buyer! Purchasing a TackleDirect e-gift certificate is easy. Just click here and select the amount of money you�d like your e-gift certificate to be worth. Then add the e-gift certificate to your cart and checkout. There will be an opportunity in checkout to enter a personal gift message. Please note, we highly recommend sending the TackleDirect e-gift certificate to your own email address and then forwarding it to the recipient. A lot of folks now have spam blockers that may not recognize our TackleDirect email address. The safest option is to add sales@tackledirect.com to your address book, send the e-gift certificate to yourself, and then forward it to a lucky recipient! The email will include instructions necessary for redeeming the e-gift certificate. It will be emailed within 24 hours of purchase and redeemable for one calendar year from the date of issue. You can also purchase an e-gift certificate by phone, fax, or mail! By Phone: Call us toll-free at 1-888-354-7335 Monday � Friday from 8:00 AM � 6:00 PM ET and Saturday from 9:00 AM - 6:00 PM ET and we�ll assist you. Please have your credit card information ready. By Fax: Complete and print this order form and fax it to 1-877-803-6229. Credit cards are the only accepted form of payment for fax orders. How do I use an in-store gift card? Easy! Just bring it in with you when you�re shopping at TackleDirect. We�ll swipe it at the cash register as we would a credit card. If you don�t have enough money on your in-store gift card to cover the cost of your purchase, you�ll be prompted to cover the outstanding amount with cash or a credit card. How do I give an in-store gift card? Visit us in-store at TackleDirect, and we�ll help you purchase in-store gift cards. In-store gift cards are available in any amount, are redeemable for up to one calendar year from issuance, and can be used in-store only. ADDRESS: 6825 Tilton Road, Bldg C, Egg Harbor Twp, NJ 08234-4426. Click here for directions. What is the difference between an in-store gift card and an e-gift certificate? In-store gift cards can only be used in-store at TackleDirect in Egg Harbor Twp, NJ. Similarly, e-gift certificates can only be used online at www.TackleDirect.com. They cannot be used interchangeably. How do I check the balance on my in-store gift card / e-gift certificate? You mean you don�t know off the top of your head?! If you need to check the balance on your in-store gift card or e-gift certificate simply reach out to use by email (sales@tackledirect.com) or by phone (toll-free 1-888-354-7335). Is there a warranty for my item? Probably! Most items are protected by a manufacturer�s warranty for at least the first year (and a lot have lifetime warranties). If, for any reason, you�re unhappy with your product, please reach out to us by email (sales@tackledirect.com) or by phone (toll-free 1-888-354-7335). We can find your warranty information and help you contact the manufacturer. Is there a manual for my item? You know, there probably is a manual for your product. When we can, we provide manuals with all orders. If you did not get one, or need a replacement, we suggest first looking on the manufacturer�s website (that�s where we look too!). If you need help searching, contact us by email (sales@tackledirect.com) or by phone (toll-free 1-888-354-7335) and we�ll get on the case. Remember when a Large was actually a Large? We understand how frustrating it can be to shop for clothing online. That�s why we provide size guides, wherever possible, on the website. If the item you�re looking at doesn�t have one, please give reach out to us by email (sales@tackledirect.com) or by phone (toll-free 1-888-354-7335) so we can help outfit you in the technical and lifestyle apparel that fits as well as it performs. Why haven't I received my rebate yet? We�d be checking the mail everyday too. Rebates are processed by the manufacturer. We suggest contacting them directly. If you need help finding a manufacturer�s phone number or email address, give us a shout via email (sales@tackledirect.com) or phone (toll-free 1-888-354-7335) and we�ll help out. It�s easy, free, and you can earn points redeemable for cash off your future purchases. Here�s how it works, you earn 1 point for every $1 spent on items, 5 points for every approved Q&A answer, 25 points for every approved product review, 50 points for every friend referral, and 100 points for every friend referral. You can then use redeem those points for cash off. Receive $5, $10, or $25 off your next purchase when you have enough points to cash out! How do I change my name, email, shipping or billing information? To update the information on your account, please log-in. Select �My Account,� then select the final option in the menu, also titled �My Account.� There you can update our name, email address, shipping information, and billing information. Help! I forgot my account password? No problem! Just click here and we�ll email you instructions for resetting your password. How do I redeem my TackleDirect reward points? Redeeming your TackleDirect reward points for cash off your next purchase is simple. Log into your account, select the �My Account� menu, and select �Rewards.� There you can manage your reward points. When you�re ready to redeem your points for cash off, simply select the available reward. TackleDirect's flagship retail store and headquarters is in Egg Harbor Township, New Jersey, just minutes from stripers in Barnegat Bay and marlin off Cape May. 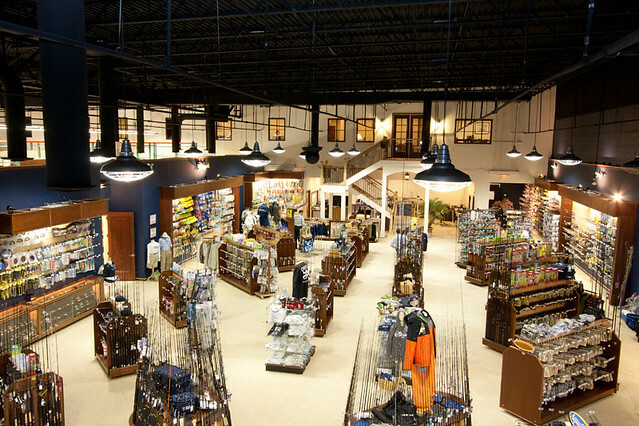 With over 60,000 in-stock items, we�re proud to have one of the largest saltwater, freshwater, and fly fishing tackle selections in the country. Even better, our shop was chosen to represent Shimano in the United States. We are home to the only Shimano Technical Center on the east coast. Read more about it here. In store, you�ll find close-out deals and specials not available online. Come see us, you won�t be disappointed! What is the Shimano Technical Center? When Shimano came to us looking for a tackle shop to represent their products in the United States, we couldn�t have been more proud. We are now home to a fully stocked, full-time Shimano Technical Center. Along with showcasing the complete product line of reels, rods, lures and storage systems that Shimano has to offer, the Shimano Technical Center at TackleDirect is a �store within a store� for all Shimano brands. This includes a G. Loomis Performance Center for rods, a PowerPro products center, a full cross section of Jackall Baits, and an apparel selection from all of the brands Shimano has to offer. You could literally travel hundreds of miles in any direction and not find a selection as comprehensive as what TackleDirect has to offer at the Shimano Technical Center. This regionally unique concept not only maintains the widest selection available, but the ProStaff at TackleDirect has also undergone extensive training in all of the products. In face, Shimano regularly sends its overseas employees to our Technical Center to train in merchandising and marketing. If you reside or travel anywhere throughout the Mid-Atlantic or Northeastern United States, a visit to the Shimano Technical Center at TackleDirect is a must-do on your list. For expert product knowledge, award winning service, and the ONLY Shimano Technical Center on the East Coast, come to TackleDirect, the World's Premiere Fishing Outfitter. We�ve been running TackleDirect for 20 years, but we�ve been fishing even longer. We�re proud to be staffed by passionate, experienced anglers who are dedicated to advancing your fishing game. No sales pitches, no hard sells. Our product specialists give it to you straight�they�ll tell you what you need and what you don�t from real experience on the water. With more than 60,000 in-stock, fishing items from top manufacturers, you can find exactly what you want, when you want it, 24 hours a day. Even better, you can shop with us three ways � online (at TackleDirect.com), over the phone (at 1-888-354-7335), or in-store (at 6825 Tilton Road, Bldg C, Egg Harbor Twp, NJ 08234). We keep up with the latest developments in the industry to offer you the advantage of hot product introductions, promotions, special offers, price drops, and exclusive pricing found only at TackleDirect. Our buying power, supplier relationships, and industry contacts let us take advantage of volume discounts, special buying opportunities, and vendor promotional allowances. We pass the savings directly on to you. Be assured, we offer the lowest possible prices on top-quality items from the best-known manufacturers. In addition, you save by not being required to pay sales tax on orders delivered outside of New Jersey! Our sophisticated virtual warehouse system enables us to find your items quickly, and ship them same, or next, business day. For most products listed in-stock, orders as late as 2:00 PM ET will ship same day. Orders after 2:00 PM ET will ship next day. On orders of $200 or more being shipped within the contiguous 48-United States, orders can be shipped for free by with valid coupon code (which we give you on the checkout page!). If you can't find this coupon code, please contact us by email (sales@tackledirect.com) or by phone (toll-free 1-888-354-7335). We also ship internationally to over 100 countries every day. Our privacy and security policies meet the highest ethical standards for the treatment of personally identifiable information in cyberspace. We offer secure online ordering using the latest encryption technology available. We also respect your privacy and do not release your personal information to others. What is the TackleDirect guarantee? It�s simple: Our goal is to exceed your expectations each and every order. If you ever have any issues and feel that we can do better, we want to hear about it. We will make sure you are taken care of the same way we would expect to be treated as a customer. We promise that we will do all that we can to make your experience with us world-class so that you don�t need to contact us, but our service really shines when you have an issue you need resolved. Please contact us with any questions or concerns. If you feel we went above and beyond the level of service you expected, we want to hear about that too. Thank you for your trust in TackleDirect. Yes, TackleDirect offers an affiliate program through the Rakuten LinkShare Affiliate Program. We offer up to 6% affiliate payout. Affiliates may not bid on tradenames (or misspellings) or phrases that include tradenames (or misspellings). Affiliates may not use the destination URL in the advertising links, nor may affiliates use the tradenames in ads. Please click here to join the TackleDirect affiliate program. For additional information, contact Jason Waring, Affiliate Manager at tackledirect@eaccountable.com. Are there reviews of TackleDirect available? Yes, tons in fact! Take your pick from the below trusted review sites. We�re proud to say that based on over 10,000 customer reviews, we have consistently earned the coveted Yahoo! Top Service honor four years in a row. TackleDirect is part of eCommerce Outdoors, a premier and rapidly growing multi-channel retail and direct marketing company that sells outdoor recreational products to help people have fun and pursue their leisure time activities. If you�re committed to customer service, passionate about our products, and enjoy a workplace founded on teamwork and respect, we�d love to hear from you! Click here to see our current job opportunities. As a part of our commitment to your privacy, TackleDirect supports and adheres to the guidelines and practices adopted by the Direct Marketing Association's "Privacy Promise to American Consumers." We have agreed to (1) provide customers with notice of their ability to opt out of information rental, sale or exchange with other marketers; (2) honor customers' requests not to share their information with other marketers; and (3) honor customers' requests not to receive mail, telephone or other solicitations from TackleDirect. We use the personal information you provide for internal purposes, such as confirming and tracking your order, subscription or registration, analyzing trends and statistics, informing you of our new products, services and offers, and providing you with information from and about TackleDirect. From time to time we might establish a business relationship with other persons or entities whom we believe trustworthy and whom we have asked to confirm that their privacy policies are consistent with ours. These are known as our TackleDirect Partners. In such cases we might share and cross-reference information, including personal information about you that will enable such persons or entities to contact you regarding products and services that may be of interest to you. To serve you better, we may combine information you give us online, in our stores or through our catalogs. We may also combine that information with publicly available information and information we receive from or cross-reference with our TackleDirect Partners and others. We use that combined information to enhance and personalize your shopping experience with us, to communicate with you about our products and events that may be of interest to you, and for other promotional purposes. Although unlikely, in certain instances we may disclose your personal information when we have reason to believe that it is necessary to identify, contact or bring legal action against persons or entities who may be causing injury to you, to TackleDirect or to others. We may also disclose your personal information when we believe the law requires it. Editing, Updating, Correcting and Deleting Information About You We want to communicate with you only if you want to hear from us. If you prefer not to receive information from TackleDirect or from the TackleDirect Partners please let us know by calling us at 1-888-354-7335, by sending us an email (sales@tackledirect.com). Please be sure to include your email address, mailing address, full name, and specifically what information you do not want to receive. If you would like to update or correct your email address, mailing address or other personal information with us please contact us the same way. TackleDirect takes special care to protect the safety and privacy of children. Our web sites are general audience sites. We do not permit anyone under the age of 13 to register with us. We also do not send email correspondence to anyone who tells us that they are under the age of 13 without their parent's consent. TackleDirect.com uses the latest in encryption technology, digital certificates, secure commerce servers, and authentication to ensure that your personal information is secure online. TackleDirect.com uses digital certificates from Verisign, Inc., a trusted, third-party Certification Authority (CA). Also know as Digital IDs, these digital certificates are similar to your driver�s license, passport, or membership card�they prove your identity. Digital IDs are useful in electronic commerce because they verify the identity of the parties involved. Making a purchase at TackleDirect.com is actually more secure that using your credit card at a local store or restaurant. We use 128 bit encryption for maximum security. We ensure the privacy of your information online, and within our back-end systems. We promise to take every precaution to protect the security of your personal information. Unfortunately, no data transmission can be guaranteed to be 100% secure. As a result, while we strive to protect your personal information, we cannot guarantee or warrant the security of any information you transmit to or from our web sites, and you do so at your own risk. We urge you to keep your password in a safe place and not to divulge it to anyone. Also, please remember to log off your account and close your browser window when you have finished your visit. This will ensure that others cannot easily access your account, especially if you are sharing a computer with someone or using a computer in a public place. Do you have an opt-out policy? Of course! You have the opportunity to opt-out of receiving communications from us at any point. If you want to be removed from our database and no longer receive communications, please email us at sales@tackledirect.com. How do I get a TackleDirect catalog? Want over 50, curated pages of the season�s hottest tackle at your fingertips? Browse the full, digital version of our catalog by clicking here. If you prefer a printed copy, click here to request a catalog be mailed to you for FREE. The most recent catalog will be mailed to you within a few weeks. How do I sign-up for your e-newsletter list? Be the first to know about product news, exclusive sales, and events. Even better, you�ll receive $10.00 off your next online purchase of $100 or more! Signing up is easy. Just enter your email address and country, here. We�re happy to help you pick out gear and swap a good fish story. EMAIL: Reach us at sales@tackledirect.com. We promise to respond within 24 hours. CHAT: Chat directly with our team from 9:00 AM � 6:00 PM ET Monday � Saturday. Please click the blue "Chat with us!" tab on the right of your screen. CALL TOLL FREE: Dial 1-888-354-7335 between 8:00 AM � 6:00 PM ET Monday - Friday and between 9:00 AM - 6:00 PM Saturday to talk directly to our staff. VISIT TACKLEDIRECT: Come see us! TackleDirect is open 9:00 AM � 6:00 PM ET Monday � Saturday at 6825 Tilton Road, Bldg C in Egg Harbor Twp, NJ 08234. We are putting on a benefit. Will TackleDirect contribute? We are proud to support activities and organizations that promote fishing, and encourage youth participation, fishing related conservation causes, Veteran fishing events, activities that teach all aspects of fishing, and other fishing related programs. Organizations registered as a 501c3 will be given special consideration. Donation requests must be made here at least 90 days prior to your event. We�re sad to see you go. To opt-out of our catalog mailing list or email promotions, please email sales@tackledirect.com. Please note that your request may take up to a week to process. The TackleDirect ProStaff program is for experienced fishing professionals who influence our brand and our sport. Think you have what it takes to join the TackleDirect ProStaff? We�d love to hear why! Email kmisher@tackledirect.com with your name and why you think you have what it takes. Good luck! Reach us by email any time! We'll respond within 24 hours. Chat directly with our team from 9AM - 5PM for immediate answers. Dial 1-888-354-7335 to talk to us directly for additional help. 6825 Tilton Road, Bldg C.